Here is Fernand Gruber’s provisional biography, the final one will appear later in the Petit Echo. Fernand was born on June 10, 1934 in Ingwiller, diocese of Strasbourg, in the Bas-Rhin.Alsacien, and proud to be so, Fernand has always loved being with his family, with his two sisters, with his mother. She remained a widow because Georges, her husband, was mobilized by the Germans in 1944, and no news of him was ever received afterwards; probably disappeared on the Russian front. Despite much research and consulting many archives, Fernand did not succeed in elucidating his father’s fate, which had a strong and lasting impact on him. His primary school was first in German from 1940 to 1944; then, from 1945 to 1948, in French. As for his secondary studies, they were first held at the White Fathers’ minor seminary in Altkirch in Alsace, and then continued in Bonnelles in Seine-et-Oise. This was then the normal process: philosophy at Kerlois – novitiate at Maison Carrée; his theology, begun in S’Heerenberg (Netherlands), was interrupted by military service in France and Germany; demobilized, he then went to Totteridge for three years of theology. He was ordained a priest on 29 June 1963 in Strasbourg. Then began six long years of study. Given Fernand’s intellectual abilities, accompanied by good language skills (French, German, English), the leaders of the Society wanted to prepare Fernand for a particular service of mission: he was oriented towards the study of the problems raised in our missions by the presence of churches of diverse denominations, especially Protestant, and more generally, it was to bring him into the field of ecumenism. He first studied Catholic theology in Paris where he obtained a degree in theology in 1965. Then a year spent at the Protestant Faculty of Theology in Paris for a doctorate. He then moved to the Ecumenical Institute of the World Council of Churches in Celigny, Switzerland, after which he spent a semester with ecumenical bodies in the United States. And, finally, two years of study at the Institut Supérieur d’Etudes Œcuméniques in Paris. We are then in June 1969. The gates of Africa will open for Fernand. Zambia welcomed him. Since September 1969 Fernand has been at the Ilondola language centre where he learns Bemba, which he speaks very well; this allows him to be at ease as a curate in Chiboté, in the diocese of Mansa. He enjoyed the daily contact with the parishioners, taking an interest in their way of life and their concerns. However, he had to provide an “interim” at the minor seminary in Bahati for two years. After that he found himself vicar in the parish of Nsakaluba – and religion teacher in the boys’ college. But his doctrinal skills led him to be appointed to the National Major Seminary of Zambia, first in Kabwe and then in Lusaka. He taught dogmatic and pastoral theology, liturgy, ecumenism and… the Bible. While being dean of studies, and in charge of a rural parish. It was with regret that he left Zambia for Saint Anne of Jerusalem on September 16, 1981. His main activity until July 1998 was the “Revue Proche-Orient Chrétien” of which he was the administrative secretary. In charge of the library, he was also “vicar” of the German parish of Jerusalem. This lasted 18 years. From September 1998, his life will take place in Europe. First in France, where he was provincial secretary for five years. Then, in December 2003 in Germany, in Frankfurt where he devoted himself to parish ministry. Tired, he then settled in Mours, where, for five years, he provided the “reception” service, while ministering in the area. He gave himself totally to it; and Brother Muratet, treasurer of the house, told us: “Fernand leaves an excellent memory at the service of the White Fathers community as to the visitors; he knew how to raise a lot of affection, friendship and esteem”. The time for retirement came in 2012. First in Bry-sur-Marne, from 2012 to 2015. Then, wishing to get closer to his family and the Alsatian area, he was appointed to the retirement home of the African Missions in St. Pierre. He was hospitalized in the summer of 2018 at the Sélestat hospital from where he left us on July 16, 2018. Thank you, Fernand, for having been an excellent confrere and a good worker in the different fields of apostolate that were yours. God welcomes you to his home, where you have found your father, whose memory has remained alive in you all your life, and your mother. Here is the provisional biographical note of Father Pierre Du Suau de la Croix. The final notice will be published later in the Petit Echo. 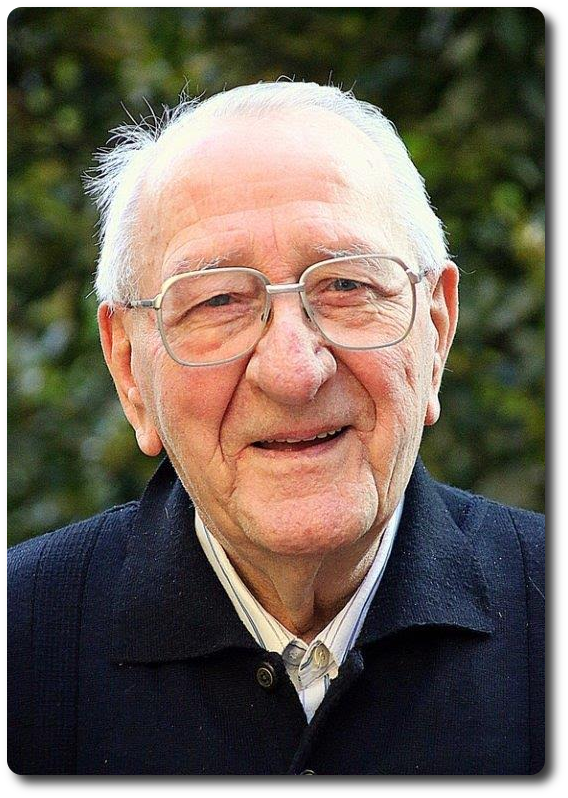 On March 4, 1923, Pierre was born into a doctor’s family in Houga d’Armagnac in the Gers. He was the fourth in a family of 7 children. He lived a happy childhood and adolescence where, in a very Christian context, a strong personality developed, helped by Scouting. From that time on, his artistic vocation became clearer. His family gave him painting lessons in Auch, where he lived at the time. The missionary call rang out very early. He matured at the seminary in Auch, which accompanied him up to the philosophical studies. He then went to the novitiate of the White Fathers at Maison Carrée (1941-1942). It was then the classical White Father formation, interrupted however by the war, which led him to participate in 3 landings: Corsica in September 1943, Italy in January 1944 and Provence in September of the same year. The Alsace campaign followed, which led him to the summer of 1945, when he was demobilized. He then devoted four years to studying theology in Tunisia. He was ordained a priest in 1949 and was appointed to Upper Volta Burkina Faso, where he went in 1950 to the diocese of Nouna. Le Sourou was his first post, transferred in 1952 to Zaba, the parish he founded. He learned three languages. The apostolate, with its different aspects: worship, catechesis, etc., absorbed him totally, and he kept a good memory of these thirteen years of rural pastoral work, including the time spent in Tansilla. He returned on leave in 1957 and 1963, but the very hot climate that weakened him made him realize that a change of country was necessary. It was Rwanda that welcomed him. He lived there for 25 years, a country he loved very much. The landscape, of course, but above all the population whose difficult language he learned. This allowed him to be an active pastor in Rwaza in the volcano region. He carried out an overwhelming pastoral activity there. 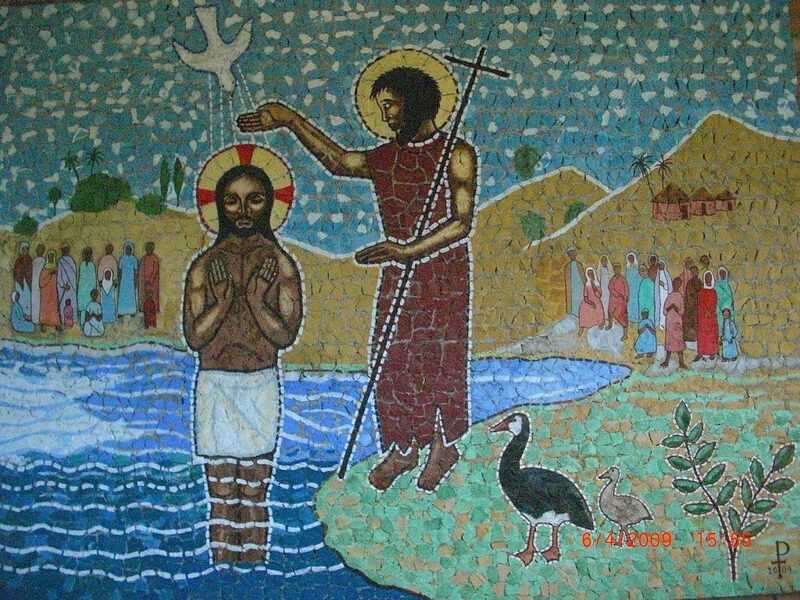 But in 1990 he was asked to put the parish apostolate on hold to take care of the decoration of the churches full-time: mosaics, stained glass windows and paintings. Before setting up his studio in Kigali, from where he radiated throughout Rwanda, he worked with a master glassmaker in Paris who introduced him to the stained glass technique. He would have liked to continue this work that he enjoyed and that many visitors admired, but the events of 1994 forced him to accept the regional’s invitation to take advantage of the evacuations of foreign nationals by French soldiers. In April 1994, he was back in Paris. He was 72 years old at the time and felt fit. Also, after a good rest period, he accepted the proposal that the provincial sent him, a proposal from Fr. Louis Blondel in South Africa: “You must come and join me because I have a training centre and we want to create an art workshop there”. So in June 1995 he landed in Johannesburg, and headed for OrangeFarm 80 km away. He bravely switched to English, and very quickly, orders poured in so that he was often absent from his community (2 French, 1 Irish and 1 Canadian) and had to abandon the Art workshop project. 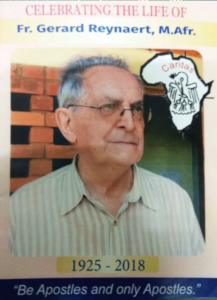 His car then took him for several weeks to Transvaal, Lesotho, Swaziland,… A work that was particularly close to his heart was a Way of the Cross with 15 stations and a Way of Light with 15 stations. It took him four months. Alas, “climbing scaffolding sometimes several metres high to paint frescoes and mosaics began to become a problem at the age of 80”. In June 2005, the decision was made to return to France. Pierre had spent 9 years in South Africa and it was hard for him to get away with it. In September 2005, Pierre was in Billère. It will be difficult for him to become sedentary after years of independent living in different countries. But the studio that was reserved for him allowed him to continue his artistic work: mosaics at the entrance of the house, various paintings, among others, Notre-Dame d’Afrique. He then wrote: “the fraternal help of the community, prayer and the daily Eucharist are a source of optimism and joy”. And in fact, the testimonies concerning this period tell us about a Pierre with a certain spirit, commenting on television, always a fan of car racing and football. But, the infirmities, the old age, brought an addiction that Pierre lived with difficulty, making his life painful for him and for his entourage yet very considerate. Thank you Pierre. You leave us the memory of a confrere whose works continue to be admired by visitors, both at the entrance to the house (mosaic) and in the chapel (Notre-Dame d’Afrique), a memory of a confrere zealous for the apostolate, full of an artistic ardour that has allowed him to embellish our lives. This is the provisional biography of Rolf Rosin. The final biographical note will be published later in the Petit Echo. Rolf was born on May 6, 1940 in Karlsbad, in the province of Sudetenland, created as an autonomous province in 1918 by the German speakers. The Austrian-Hungarian Monarchy was in decomposition and in order not to be integrated into the Czech Republic, founded on 28 October 1918 in Prague, the German speakers preferred relative autonomy. After the Second World War, Sudetenland’s autonomy was abolished and most German speakers took refuge in Germany. Rolf’s family has chosen Bamberg in Bavaria as their new place of residence. He grew up with two brothers in a very Christian and musical family. He attended the Deutsche Gymnasium in Bamberg and on July 18 he passed his baccalaureate. His religion teacher testified that he was one of the most attentive to religious themes and was therefore not surprised that Rolf decided for a missionary life. In September 1962, he returned to the Major Seminary of the White Fathers in Trier. From 1964 to 1965 he did his novitiate at Hörstel and then, for theology, he went to Totteridge. On June 26, 1968, he took his missionary oath and was ordained a priest in Bamberg on June 29, 1969. He was then appointed to the Diocese of Kasama in Zambia. He attended the language course in Ilondola and, in February 1970, began pastoral activities in the Mulobola parishes, then Chilubi and Malole for more than thirty years. In his letters to relatives, friends and benefactors, he speaks mainly of three realities of his life in Zambia: the political and economic situation, the parishes with a few dozen branches, the small Christian communities and their glorification in Europe. His formators found that Rolf was noticed for doing the tasks required well without exaggeration. In his pastoral work, he suffered from this quality. With the exception of six months as a replacement for the diocesan treasurer in Kasama and as a treasurer in the language centre in Ilondola, he has worked in the three very large parishes of Ilondola, Chilugi and Lubishi. All three consist of a centre and a few dozen branches or sub-centres, visited only two or three times a year by the priest to celebrate the Eucharist. The Bishop came irregularly to the branches to give the sacrament of confirmation. Pastoral care was provided by catechists. After the Second Vatican Council, the Church developed the “small Christian community” as the vital organism of pastoral care by creating small groups that met every week to read the Gospel in the given social context. Rolf was well aware of the situation in Zambia and when he was on holiday in Germany and Austria, he was surprised by the enthusiasm of Christians who, from afar, saw these small Christian communities as miraculous solutions to pastoral problems both in Africa and in Europe. He talked about it in all his letters to friends. When Rolf arrived in Zambia, the country, which became independent in 1964, was in search of its identity. Politics proclaimed a “Zambian humanism” to solve economic difficulties. In August 1979, Christian church leaders issued a statement opposing scientific socialism, hidden in “Zambian humanism”, which would not help to overcome underdevelopment and would not guarantee the human rights of the people. Rolf, himself a refugee from Soviet communism, regularly mentions this problem in his letters. His concerns for the political and social situation surely have their origin in the fact that he had gone through the loss of his childhood country, exile and integration into another environment accompanied by material poverty. Rolf interrupted his pastoral work three times, twice to go to Jerusalem, in 1979 to make the Great Retreat and in 1999 for the Bible course, the third time when he returned to Europe in 1985 for four years. He was appointed to Axams, 10 km from Innsbruck in Tirol where he lived in a community, newly established as a new project, with two confreres, Fr. Anton Mettrop, a Dutch confrere and Fr. Walter Vogt. The team was in charge of missionary and vocational animation. It will put in place all the means to make the Society known, not only in the parishes of the diocese and Catholic movements, but also beyond the diocesan borders. The confreres will open the doors of their homes by organizing reflection days for young people. In December 1989, Rolf returned to the diocese of Kasama, but had to interrupt his stay several times to get treatment in Germany. In December 2006 he was appointed in the provinces. From 2007 to 2018 he was in charge of the bursar’s office in Haigerloch, in the community of elderly confreres. During the last year of his life, he had to endure one more ordeal when the area sold Haigerloch’s house, the second foundation after Trier. The community has settled in a CARITAS house in Hechingen, about ten kilometres from Haigerloch. 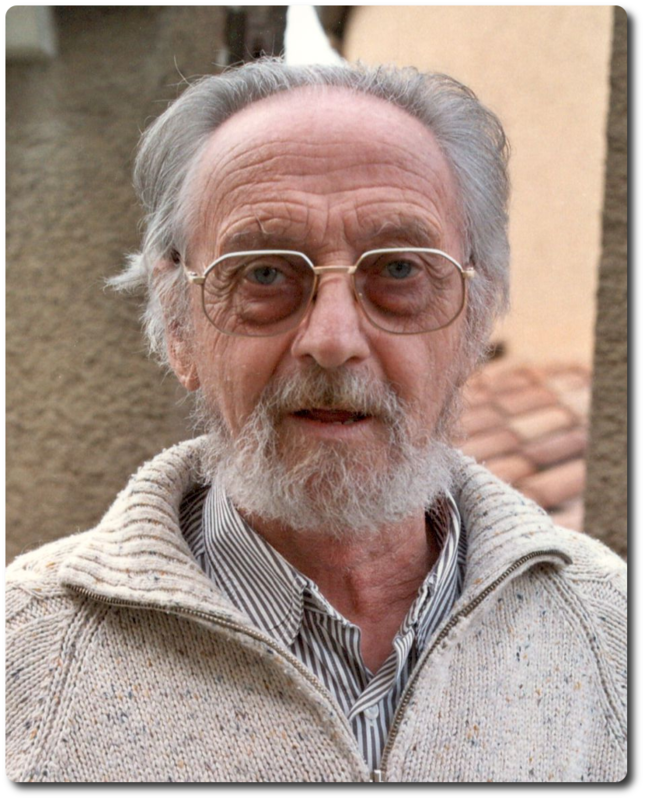 In February 2019, Rolf entered the university clinic in Tübingen where he died on the morning of March 2 and was buried on March 8 in the Missionaries of Africa section at Haigerloch cemetery. Herman was born on the 7th March 1937 at Essen in the Province of Antwerp very close to the Dutch border. His parents were farmers and over the course of the years they had ten children. After secondary school at the Junior Seminary of Hoogstraten, Herman entered the White Fathers at Boechout in September 1956. It was the same year that his older brother René (+2017) left for Burundi. After the novitiate in Varsenare, Herman went to Heverlee to study Theology. He took his Missionary Oath there on the 28th June 1962 followed by priestly ordination on the 29th June 1963. 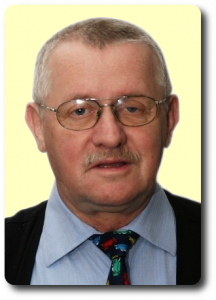 Herman was described as a modest, helpful, friendly and very sociable person. He was not very talkative, but was interested in others. He was an unobtrusive man, always in the same good mood. He radiated benevolence and kindness. He did not get mad, but one should not push him too hard. He was pretty unshakeable, a little sceptical perhaps. He had practical common sense and he had undeniable artistic gifts. At the end of 1972, the Hutu rebellion was put down in what has been called the Hutu genocide in Burundi. In January 1973, Herman returned to Belgium traumatised by these events. He taught religion in a secondary school in Borgerhout and lived in our community in Berchem. He went to Greece with a group of young people. He took some sabbatical time following a Bible course and studying catechesis always with a view to teaching. After the Session/Retreat in Jerusalem in 1980, he was ready to return to Africa. reason, because he had never been expelled, his application to return to Burundi was turned down. Maybe Rwanda? The Regional Council of Rwanda agreed to accept him only after a long discussion. Herman had a reputation for being “progressive”. He arrived in Kigali in January 1984. After studying the language at the Language Centre, he was appointed curate at Kaduha in the Diocese of Butare. Herman dreamed of forming authentic Small Christian Communities. So he was allowed to join the parish of Rusumo in the Diocese of Kibungo, where Father Stany de Jamblinne worked along the same lines in the Eglise-Monde movement. Herman felt comfortable in this pastoral ministry. He painted tableaux and decorated churches. He supported local artists, who made decorative panels in bas-relief, characteristic of the region. In October 2000, Herman was appointed to Rome in charge of Ongoing Formation and the organization of the Mid-Life Renewal programme. He took on several administrative tasks in the city or in the Vatican and collaborated with Brother Karl Stärk in the photo library. He underwent heart surgery but made a complete recovery. In July 2006, he returned definitively to Belgium where he joined the community in Namur and helped Gus Beeckmans in the Photo-Service restoring old historical photos. He stayed there for 10 years, always as thin as a rake, true to himself and a bit of a joker. He was a tad special, a critical observer of events who never raised his voice. However, he began to have serious breathing problems that required respiratory physiotherapy. In October 2016, Herman asked to go to Antwerp. The Photo Service was being transferred and he wanted to be closer to his older brother René who was seriously ill. At the beginning of 2018 his breathing problems got worse and on the 9th March, he joined the ‘Avondrust’ community in Varsenare. Herman was very grateful for the prodigious care he received and enjoyed breathing the pure air. He joyfully pored over his art albums while preparing himself for the inevitable. He immersed himself into Carlos Mesters’ commentary on the Suffering Servant. In a notebook, he wrote, “Yes, the inevitable suffering of man, projected onto one person, Christ, in me”. He suffered terrible crises of suffocation. Towards the middle of April, he felt that the end was near. He noted, “Resurrection does not follow death, it takes place the moment of death itself. It is this beginning of a ‘different life’ that I am looking forward to.” He died on the 20th April 2018 at the hospital of Saint-Jean in Bruges. Marc De Wulf, superior of Varsenare was at his bedside. On the 26th April 2018, we laid Herman to rest in Varsenare, surrounded by his family and many confreres. May he rest in peace. Erwin was born on the 22nd March 1940 at Gross-Leschienen in the Diocese of Ermsland in what was then eastern Prussia. His family name, at the time, was Koschewski. His father was killed during the 2nd World War. In 1945, his mother fled with her four children towards the west and after a long journey they arrived in Hechthausen in the north of Germany. In 1947, Erwin began primary school. His mother married again with Franz Echtner, who adopted the four children and they took his family name. In 1952, the family moved to Krefeld on the banks of the Rhine. Erwin finished his primary schooling there in 1955. Erwin began his commercial studies, which he successfully finished in 1958. He got a job but he felt called by God to go on the missions. According to the reference from his employer, Erwin was described as a conscientious collaborator, easy to get on with, punctual, and respectful of his co-workers. Erwin entered the White Fathers at Langenfeld on the 1st June 1959 to begin his postulancy. In 1960, we find him at the novitiate in Hörstel. He took his 1st Missionary Oath there on the 4th February 1962 when he was just a month shy of his 22nd birthday. From February 1962 to March 1965, he continued his training at the Brothers’ Formation Centre in Marienthal, Luxembourg. In November 1965, Bro. Echtner left for Kipalapala in the Diocese of Tabora, Tanzania. He only studied Kiswahili for a short time before going to work at the printing press nearby. On the 1st February 1967, he was appointed as editor and manager of the Catholic newspaper, KIONGOZI. He took his Perpetual Missionary Oath in Kipalapala on the 24th February 1968. He moved to the Social Training Centre in Nyegezi near Mwanza in July 1969 before returning to the printing press in Kipalapala later the same year. He also spent some time in the procure of Dar-es-Salaam from 1971. After many years of service in Tanzania, Erwin began to look for other horizons. His first wish was to study for the priesthood and after a long period of reflection on all sides, he began studies for the priesthood in London in January 1974. However, already by the end of the 1st term, Erwin had to face up to the fact reluctantly that this orientation was not for him. So he had to abandon his idea of becoming a priest. In 1976, we find Erwin in Germany as bursar of the community in Trier. His training in book-keeping and accounts meant that he felt more at ease and he was able to render a great service to the community. In 1977, he was appointed to the Afrikanum in Cologne. Here he found his true vocation and for the next 33 years he was a committed worker in the area of receiving refugee children and young people from Africa. He had his own personal experience as a refugee and he could empathise with the children coming from Angola, the Congo, Ethiopia and Somalia. These countries were experiencing constant revolts, wars and revolutions. The revolutionary leaders were putting hundreds of children on planes for Germany hoping that they would receive a good education and be able afterwards to serve their liberated countries. On the 31st of August 1990, Erwin suffered a heart attack which obliged him to reduce his activities on behalf of his “his children” many of whom had since become adults. In April 2011, he was diagnosed with cancer and he was appointed to the community at Trier where he died on the 6th October 2017. The funeral liturgy took place in the chapel of the Brothers of Charity followed by burial in our plot in the city cemetery of Trier.